Shepherd's Harvest - Minnesota's sheep and wool festival - was this past weekend and I think it's safe to say that I was an active attendee. Last year I felt like I went a little crazy with my purchases, so this year I arrived with a small list of humble purchases I was hoping to make to keep myself reigned in. I had already decided I wasn't going to buy any fleece this year because I still haven't spun what I bought last year and I wasn't interested in buying yarn, so really what I was looking for were small samples of this and that for a class I'm going to be teaching next month all about fiber. Needless to say, I was able to find everything on my list. I had methodically worked my way through all of the buildings that morning (Buildings A-D) before meeting up with a friend. I had made my way through buildings A, B, and C before disaster struck. My friend texted me, "Where are you?" "Building D. Save me from myself!!" I had come face to face with this fleece. My friend did not, in fact, save me. Instead, he said something like "you need to buy that." Some help he is. I really am excited about it, though, and hopefully I will actually get around to using it. It's a Corriedale fleece from a young ram and I'm a sucker for those natural colors. Have you ever seen a colored Corriedale like that? I sure haven't. I washed a handful of locks when I got home to play around with and fully intended to wash the whole fleece in one go with the intention of carding it, but when I combed a few locks and spun them up, I swooned. So now I've stored the fleece without washing it and will wash it more carefully to keep the locks intact. Washing the whole fleece at once is just fine for carding because the fibers are going to get jumbled up when you card them anyway, but for combing you want the locks to stay together so you can comb the fibers into a parallel organization. That would be me with the Grand Champion fleece, which I won because I'm greedy like that. So there, now you know the truth. I have no idea where I'm going to put all of this when I move in two weeks, but I'm sure it'll all work out. I'm eager to get back to my wheel, but sample knitting keeps me busy, busy, busy. Oh, and speaking of moving, the most exciting thing about my new apartment is that I'm finally going to have internet at home again! And my front yard will be a park, which will maybe entice me to get out and take FO pictures again. That would be nice, wouldn't it? I can't wait to see you spin those fleeces!! It was nice to see you again at Shepherd's Harvest. 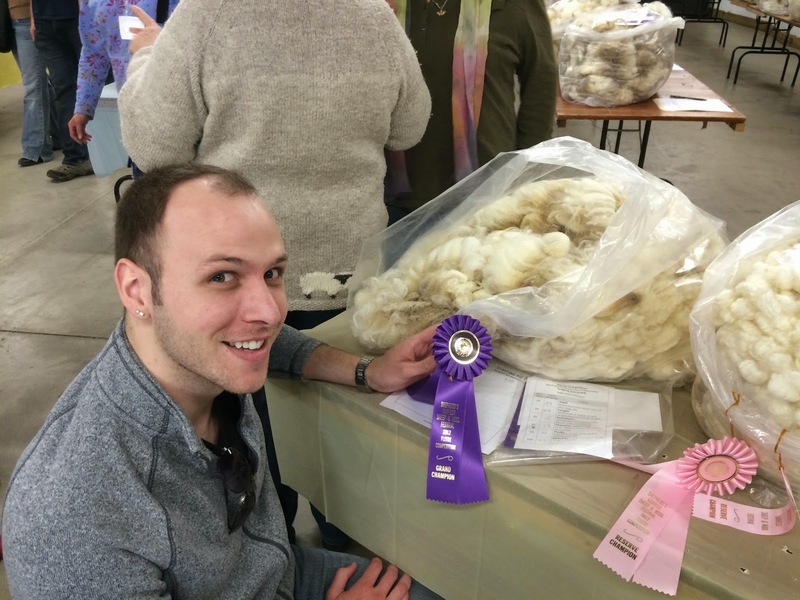 I know little about sheep wool, but that Grand Champion fleece looks pretty darn awesome to me! Looking forward to seeing what you spin and knit. Both of them are gorgeous. I've only bought two fleeces in my life, and one got ruined (a friend washed it in her front loader) and the other was a beautiful color but not so soft. Alas. Isn't it a rule that you're supposed to wear a handknit to a wool festival?! Ah, those are gorgeous. I haven't touched my wheel since last summer. I should give it a try again. Those two fleeces are just gorgeous, i´m pretty sure they are worthy, i can´t wait to see what you spin a knit with them!. I completely support your friend in enabling you on the purchase of those fleeces - he is obviously someone you should listen to :-). The new apt (and internet) sounds awesome!